Concentrating solar power technologies have been under development for some time in order to achieve higher fluid temperatures than flat plate collectors, so that higher conversion efficiency can be attained with a solar plant producing electricity. An introduction to four concentrating solar power technologies is available in another article. The focus of this article will be solar parabolic dish – stirling engine systems. radiation. Direct solar radiation (also called beam radiation) is that portion of the incoming solar radiation that travels from the sun to the surface of the earth in essentially a straight line, without being reflected, deflected, or absorbed and retransmitted by particles or gases in the atmosphere. 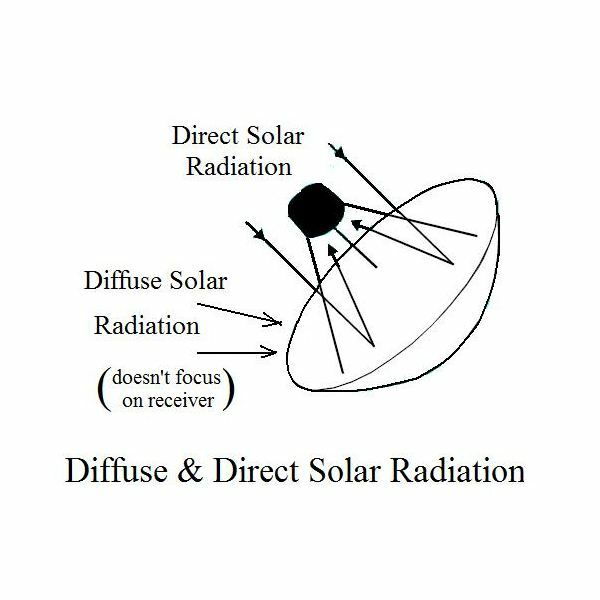 The other component of terrestrial solar radiation is called diffuse solar radiation. It is the portion of incoming solar radiation that is reflected, deflected, or absorbed and retransmitted by particle or gases in the atmosphere, but still ultimately reaches the earth’s surface. As shown in the diagram at the right, direct solar radiation rays are all parallel to each other and thus are focused by the solar parabolic dish reflector onto the stirling engine receiver. The diffuse solar radiation strikes the solar parabolic dish from many different directions and thus is not focused onto the stirling engine receiver. parabolic dish reflector which moves to continuously face the sun, thus producing a high temperature (~1452oF) in the fluid receiving the focused solar energy. Individual solar parabolic dish – stirling engine units, like the one shown in the image at the left, typically produce 3 to 25 kW each. By using a great many units in an array for a solar plant, as shown in the image at the right, solar power can be produced at the MW level in a solar plant. Here are some advantages and disadvantages of a solar parabolic dish – stirling engine solar plant in comparison with the other three concentrating solar power technologies introduced in the first article of this series: parabolic trough, heliotrope solar tower, and linear fresnel systems. The high fluid temperature attainable by the two axis tracking solar parabolic dish leads to high conversion efficiency of solar power to electricity (for a heat engine). Conversion efficiency approaching 30% has been achieved. This is the highest conversion efficiency of the concentrating solar power technologies. 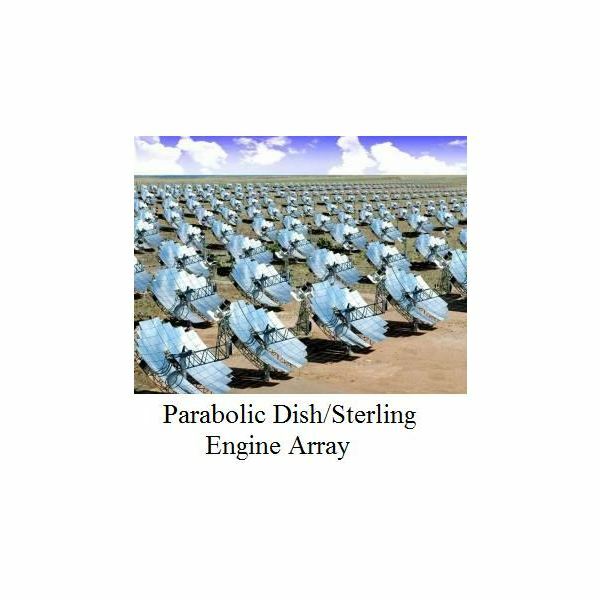 The solar parabolic dish – stirling engine system can be used as a relatively small distributed power source, because a single unit is self-contained. By combining a lot of the units, MW levels of electricity from solar power can be produced. The solar parabolic dish – stirling engine system has only a very minimal water requirement. The engine is air cooled, so no cooling water is needed and the performance penalty associated with dry air condenser cooling for a steam power plant doesn’t enter into the picture. Due to the distributed nature of the solar parabolic dish – stirling engine system, with many individual units, this type of system doesn’t lend itself well for thermal energy storage, to allow electricity generation when the sun isn’t shining. There are currently no commercial solar parabolic dish – stirling engine solar plants in operation early in 2010. Several are in the planning stages, however in the southwestern United States and around the world. Concentrating solar technologies bring increased efficiency for solar power conversion to electricity in a solar power plant. 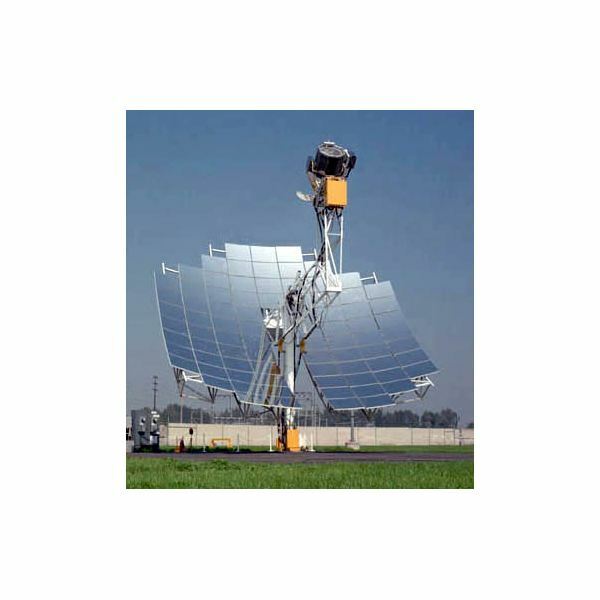 The four current concentrating solar technologies are parabolic solar reflectors, heliostat solar power tower, parabolic dish – stirling engine, and linear fresnel systems.